For those familiar with violet notes, Grey Flannel has violet in it but it’s the leaf, not the flower. So if you love the fairly recent Balenciaga (2010), don’t go out and buy this one. It’s very different. The distinctive methyl heptin carbonate molecule (MHC) was isolated from violet leaves in 1903 and, although expensive, was used fairly commonly. According to Luca Turin, MHC has a gassy-peppery aspect and it is LOUD although I wouldn’t know having never smelled it on its own. In fact, I don’t remember EXACTLY what the Grey Flannel of the 80s smelled like. I only remember it was green but also chic and complex… mossy, lemony (barely), woody. I wore Grey Flannel in the 80s because I had tired of citrus scents and I was looking for something more sophisticated for special occasions. I was a very different person then… working for a national railway as a management trainee and later at a high-tech company and wearing tailored business suits eager to climb the corporate ladder. Of course, the ladder came crashing down during the recession of the early 90s… but I had alot of fun at the time and I often wore Grey Flannel when I wanted to feel like a businessman. But today’s Grey Flannel is shrill and synthetic… it has no moving parts. It feels not like a shadow of its former self… but more like the skeleton. There’s no flesh which makes me suspect that it is almost entirely synthetic. It’s got throw and it lasts longer than most other fragrances but the accord is so loud, you almost wish it didn’t have longevity. When it was launched, Grey Flannel was a masterpiece but today it’s worth, sadly, what I paid for it at a discount store. If you’re a man and you’re looking for something similar and you don’t mind wearing a woman’s fragrance, Chanel No. 19 is green, poisonous and wonderful. I feel bad about what Grey Flannel is like today. 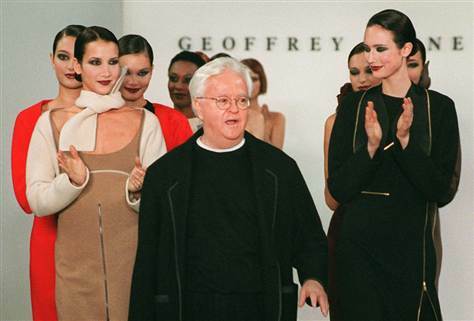 But I enjoyed the following video immensely (particularly part 2 when we see the archives), remembering what a genius Geoffrey Beene was and giving us an idea of how great the original fragrance was like. By the way, those archives should travel, if they haven’t already! They would make a great museum exhibit.